To everyone who says we must respect the verdict: How long are we supposed to remain calm when the laws we are called to respect exist in an open assault on our humanity? There isn’t a good reason for me to be as angry as I am over the “not guilty” verdict handed down for George Zimmerman in the killing of 17-year-old Trayvon Martin. I always knew that would be the outcome. No amount of flat-out lies or inconsistencies in Zimmerman’s story, nor compassion for two grieving parents who lost their son in the most heinous and senseless of ways, was going to override the lack of respect the United States justice system has for black bodies. Disappointment is for people who have faith in the system. I knew that better than I know my own name. And yet there I was, crying rage-filled tears as “ZIMMERMAN NOT GUILTY” appeared on television. Because no amount of cynicism can override the pain of knowing a 17-year-old boy is dead through no fault of his own, and no one will be held accountable. Perhaps the state of Florida is at fault: the prosecutors could have put together a stronger case. Perhaps the jury is at fault: maybe they didn’t notice Zimmerman’s lies and call his version of events into question the way they could have. But in truth, the whole damn country is at fault for continuing to allow the racist ideology that renders blackness a threat to the American way of life. The auction blocks and “Colored only” signs are past, but we haven’t learned the lessons of our history; we’re merely products of it. George Zimmerman was prosecuted, yes, but he was never really on trial. Trayvon Martin’s lifeless body was put on trial for having the audacity to exist and be black. Zimmerman started that the night he killed Trayvon, profiling the lanky teen for being “up to no good” and not belonging in his gated community—when he had no information to go on besides the fact Trayvon was walking in the rain. During the trial, defense attorneys Mark O’Mara and Don West trotted out every racist stereotype attached to black boys throughout history, suggesting that Trayvon used supernatural size, strength and speed to beat Zimmerman. To my disgust, O’Mara literally invoked the same justification for killing Trayvon as was used to justify lynchings. He called to the witness stand Olivia Bertalan, one of Zimmerman’s former neighbors, who told the story of her home being burglarized by two young African-American boys while she and her children feared for their lives. It was terrifying indeed, and it had absolutely no connection to the case at hand. But O’Mara presented the jury with the “perfect victim,” which Trayvon could never be: a white woman living in fear of black criminals. Zimmerman had offered to help her the night her home was robbed. Implicit in the defense’s closing argument: he was also protecting her the night he killed Trayvon Martin. On MSNBC’s UP w/ Steve Kornacki, Daryl Parks, the attorney for Trayvon’s family, said he didn’t want to call O’Mara a racist. But when you traffic in those racist tropes in a court of law, it doesn’t matter if you’re labeled a racist or not. The damage is done. In a statement released the day after the verdict was announced, President Obama said: “I know this case has elicited strong passions. And in the wake of the verdict, I know those passions may be running even higher. But we are a nation of laws, and a jury has spoken. I now ask every American to respect the call for calm reflection from two parents who lost their young son.” But I ask him, and everyone else who says we must respect the verdict: How long are we supposed to remain calm when the laws we are called to respect exist in an open assault on our humanity? The arc of the moral universe bends slowly. Our lives are on the line right now. But if we are, as I suggested, merely products of our history, then alongside our history of injustice exists a history of resistance, and this, too, has taken shape in the aftermath. I was in New York City to witness and participate in the rally-turned-march that took over the streets of midtown, as thousands of people of marched from Union Square Park to Times Square. Parents brought their children; one wore a homemade sign that read, “Don’t Shoot Me.” People cheered from the sidelines, and on occasion joined in. Cars respected the new traffic laws or were met with fierce opposition when they didn’t. A man stood asking, “Have you ever considered Zimmerman was not guilty?” He identified himself as an attorney, but his question went ignored. 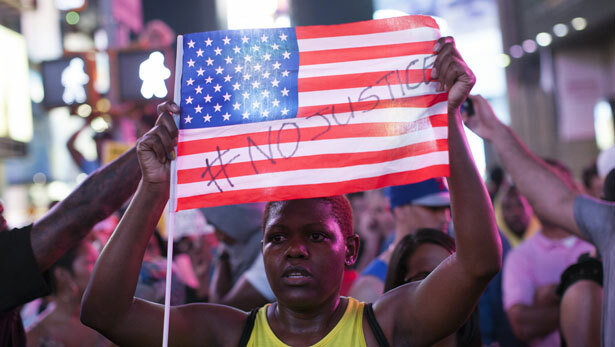 Trayvon’s name became a rallying cry. It mingled with the call-and-response chants of “No justice, no peace!” and “Hey hey, ho ho, the new Jim Crow has got to go!” The police did what they could to stop the march, but in the end they just weren’t any match for the power of a people determined to fight the injustice in this country. I watched nearly every minute of George Zimmerman’s trial, and the disappointment I felt during that time was replaced by faint bits of hope as I watched so many people come together for Trayvon (and Oscar Grant, and Sean Bell, and Rekia Boyd and Aiyana Stanley-Jones…). It affirmed something I had been feeling in recent months. For those of us left among the marginalized and oppression, be they black boys buying Skittles in Florida; women raising their voices against virulent anti-abortion measures in Texas, Ohio or North Carolina; prisoners going hungry in California; innocent men awaiting execution in Georgia; little girls lying asleep in Detroit; or transwomen who defend themselves and end up locked behind bars in Minnesota; the time is now to commit to the revolutionary project of living our lives out loud. Our rage is valuable, whether we anticipate its coming or not. What’s next is that each of us take whatever gift we have and use it in a way that honors and values black life. That is the legacy Trayvon Martin can leave to this world. White supremacy acquits George Zimmerman.